The Napoleon consistently provides a top experience, cruising deep within Provence. Explore the culinary, cultural, and historical treasures of this region on this elegant vessel. Napoleon brings the best of barge cruising and river cruising together in a uniquely elegant hybrid. As the only vessel in our French fleet to cruise exclusively on a river, as opposed to a manmade canal, the Napoleon’s route covers 150 miles, revealing a dazzling plethora of the region’s cultural bounty and historical treasures. Eminent Roman ruins, exact scenes painted by Impressionist artists, and charming hilltop villages — indeed, Provence is rich with prized relics and artisan delights waiting to be discovered. 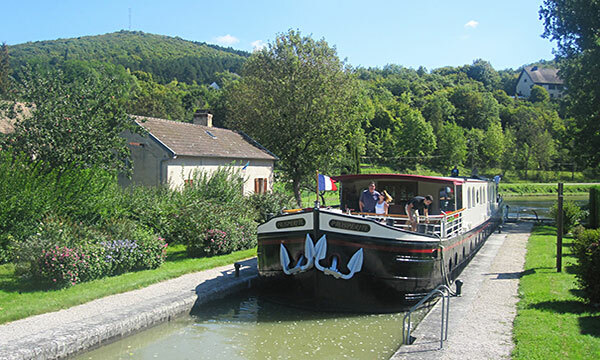 Note that Napoleon cruises on a petite river as opposed to a manmade canal, so biking opportunities, while daily, are not as plentiful compared to traditional canal cruising. The palatial vessel boasts three levels, including a spacious deck devoting 800 square feet to the recreational pleasures of outdoor living; guests enjoy the comforts of a hot tub, reclining deck chairs, and a special “al fresco” dining area. Exquisite French-style furnishings and accent pieces define the supremely comfortable salon, while the indoor dining room boasts what is perhaps the most interesting decor in all of barging: colorful murals depicting the life of Napoleon Bonaparte, as well as personalities associated with Provence. Cabins are tastefully decorated with country cottage flair, boasting clever storage and beautifully tiled bathrooms. Cuisine focuses on the region’s rustic Provincial fare through a modern presentation, and wine pairings specific to the Rhone Valley are served often. Gourmands and epicureans will adore the private wine tastings, black truffle hunting, and the trip to the local produce market with Chef. An attentive crew catering to every need furthers the many amenities found exclusively on this splendid vessel. In the afternoon, you will be met in the lobby of your Paris hotel by a transfer agent and chauffeured to the Gare de Lyon Train Station. Your cruise includes round trip First Class train tickets between Paris and Provence. As you alight at the Avignon TGV Station, a member of Napoleon crew will be on the platform and will chauffeur you to the barge moored at the Avignon gates. After the traditional welcome and introduction to crew, Napoleon sets sail to the country mooring of Roquemaure. Enjoy the first of many gourmet dinners. This morning, a walking tour introduces Avignon, home of the Papacy from 1309-77. Discover the Palais des Papes, one of the largest Gothic buildings in Europe, reflecting its importance as the seat of Western Christianity during this time. Browse the shops or enjoy a coffee in the square before returning to Napoleon for a leisurely afternoon cruise. Socialize in the salon while tasting wines from the onboard cellar, or enjoy craft cocktails made with spirits from the open bar before tonight's gourmet dinner. This morning, your Tour Guide escorts you on a scenic drive to Grignan. This fortified medieval village, nestled at the foot of its castle, houses an exceptional collection of ancient roses, whose abundant flowers adorn the old walls with floral finery. After lunch in a local auberge, it’s on to a truffle farm. Discover and taste this world-renowned delicacy. Return to the barge for a late afternoon cruise as the sun sets over the enchanting waterway. Cocktails and canapes are served while Chef puts the finishing touches on tonight's dinner. Relax on deck this morning as Napoleon cruises south along the Rhone Valley through the magnificent vineyards that line the shore. This afternoon, indulge in traditional tastes of France - wine and chocolate! Swirl, sip, and savor local vintages at a local winery, and then visit the Valrhona chocolate shop for a most delicious exploration of sumptuous French sweets. Experience one of barging’s most elegant dining rooms, at dinner, enlivened by a mural picturing the famous personalities of the Provence region. This morning, lounge on the deck with a cup of coffee or join the Captain in his wheelhouse as Napoleon glides by panoramic scenes of the Rhone Valley. This afternoon, discover the remarkable town of Vienne, a major Roman outpost from the first century BC, offering a completely intact Roman temple, as well as an impressive outdoor theater that is still in use! 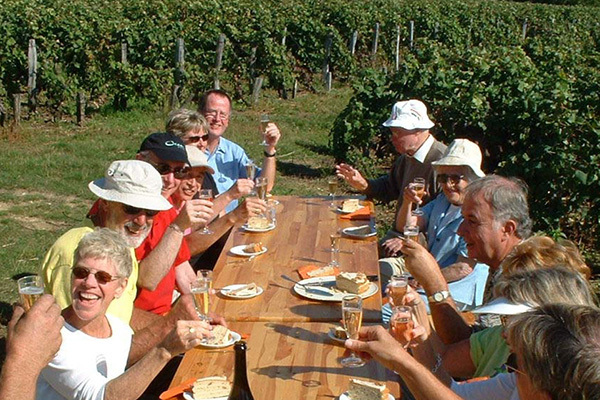 Next, a visit to local vineyard encourages swirling, sipping, and savoring the area's signature wines. Return to the Napoleon for cocktail hour before Chef presents tonight's dinner. The day’s adventures begin with a morning cruise. Lounge on the spacious deck with a cup of coffee, read in the salon, or laze in the hot tub. Your Tour Guide then introduces the city of Lyon with a tour of the Basilica of Notre-Dame de Fourviere, a Gothic Revival church affording breathtaking panoramic views. Then it’s strolling and shopping along the cobblestoned streets of Vieux Lyon, a well-preserved Renaissance neighborhood lined with 16th century buildings. Back onboard, Chef is preparing tonight's Farewell Feast. In the morning after breakfast, you will be chauffeured to the Lyon TGV Station and provided with First Class tickets to a late morning train back to the Paris Gare de Lyon Train Station. As you alight, a representative of Napoleon will be on the platform and will help you to the taxi line or to your pre-arranged private transfer. Estimated arrival time back to Paris is 2:00 pm. The services of the Napoleon end at the Gare de Lyon. In the afternoon, you will be met in the lobby of your Paris hotel by a transfer agent and be chauffeured to the Gare de Lyon Train Station. Your cruise includes round trip First Class train tickets from Paris to Lyon. As you alight, a member of Napoleon crew will be on the platform and will chauffeur you to the barge moored in Lyon. A traditional welcome and introduction to the crew awaits you. Enjoy the first of many gourmet dinners. Discover Lyon this morning, as your Tour Guide introduces the Basilica of Notre-Dame de Fourviere, a Gothic Revival church affording panoramic views of the city. Then it’s strolling and shopping along the cobblestoned streets of Vieux Lyon, a well-preserved Renaissance neighborhood lined with 16th century buildings. This afternoon, Napoleon begins cruising as she slips onto the River Rhone. Lounge on the spacious deck, read in the salon, or lounge in the hot tub while sipping champagne before another gourmet dinner. Relax on deck this morning as Napoleon cruises south along the Rhone Valley through the magnificent vineyards that line the shore. This afternoon, indulge in traditional tastes of France - wine and chocolate! Sip and savor local vintages at a local winery, and then visit the Valrhona chocolate shop for a delicious exploration of sumptuous French sweets. Dinner is served onboard; as always, you will experience one of barging’s most elegant dining rooms, enlivened by a mural picturing the famous personalities of the Provence region. This morning, lounge on the deck with a cup of coffee or join the Captain in his wheelhouse as Napoleon glides by panoramic scenes of the Rhone Valley. This afternoon, your Tour Guide accompanies you to Viviers, an atmospheric Medieval town forgotten by time. A former capital of the Languedoc region, the preserved cobblestoned streets are well worth exploring, and a peek into the 12th century Saint Vincent Cathedral reveals the town's stunning Gobelins tapestries. Return to the barge for cocktails and canapes before tonight's dinner. This morning, your Tour Guide escorts you on a scenic drive to Grignan. This fortified medieval village, nestled at the foot of its castle, houses an exceptional collection of ancient roses, whose abundant flowers adorn the old walls with floral finery. After lunch in a local auberge, it’s on to a truffle farm. Discover and taste this world-renowned delicacy. Return to the barge for a late afternoon cruise. Socialize in the salon, sample the wines from the onboard cellar, or relax on the deck as Chef is crafting tonight's gourmet dinner. A morning cruise begins the day's adventures. Next, tour the vineyards and taste wines produced at the Chateau La Nerthe. Then it’s back onto Napoleon, cruising to the ancient gates of Avignon. A walking tour introduces Avignon, home of the Papacy from 1309-77. Explore the Palais des Papes, one of the largest Gothic buildings in Europe, reflecting its importance as the seat of Western Christianity during this time. Browse the shops or enjoy a coffee in the square before returning to Napoleon for tonight's Farewell Feast. In the morning after breakfast, you will be chauffeured to the Avignon TGV Station and provided with First Class tickets to a late morning train back to the Paris Gare de Lyon Train Station. As you alight, a representative of Napoleon will be on the platform and will help you to the taxi line or to your pre-arranged private transfer. Estimated arrival time back to Paris is 2:00 pm. The services of the Napoleon end at the Gare de Lyon. In the afternoon, you will be met in the lobby of your Paris hotel by a transfer agent and be chauffeured to the Gare de Lyon Train Station. Your cruise includes round trip First Class train tickets from Paris to Provence. As you alight in Valence, a member of Napoleon crew will be on the platform and will chauffeur you to the barge moored at Tain l’Hermitage/Tournon. A traditional welcome and introduction to the crew awaits you. Savor a sommelier-led onboard tasting of North Rhone Valley wines before enjoying the first of many gourmet dinners. Relax on the top deck and watch as the beautiful scenery of the Rhone Valley slips by during your morning cruise. This afternoon, your Tour Guide introduces Viviers, an atmospheric town forgotten by time. Explore the quiet neighborhoods and tiny shops found along the charming cobblestoned streets, and take a peek into Saint Vincent Cathedral with its stunning Gobelins tapestries. Return to the barge to play the traditional French game of boules: it’s guests vs. crew! Relive the day’s adventures with drinks and dinner onboard. This morning, your Tour Guide chauffeurs you to a truffle farm for a tasting of that most expensive and unusual mushroom known as the Black Diamond. Lunch is taken ashore at a local bistro in the very scenic village of Grignan, famous for its wild roses and medieval Chateau. Return to the barge for a late afternoon cruise through Ecluse de Bollene, one of the deepest locks in Europe. Socialize in the salon over a glass of wine, laze on deck and admire the scenery. Later, enjoy cocktails and canapes as Chef is crafting another gourmet dinner. 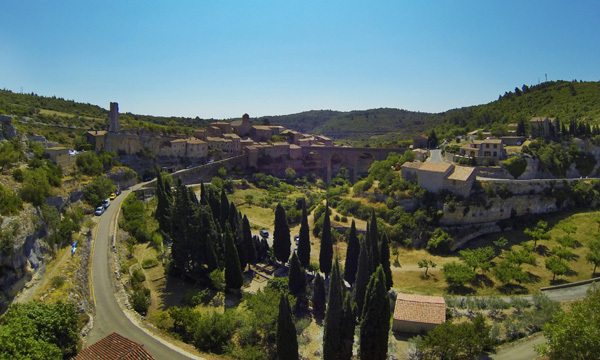 This morning your Tour Guide introduces Chateauneuf-des-Pape, a charming village where you’ll enjoy a tasting of its signature wines. This afternoon, cruise past the Pont (bridge) d’Avignon on the way to tonight’s mooring near to the gate of the walled city. Then its on to the incredible Pont du Gard. Built in the first century A.D. it is the highest of the Roman aqueducts in Europe and very well-preserved. Back on board, it’s time for another indulgent dinner and what about an apres-dinner stroll or café in Avignon’s town square? Avignon was the seat of the papacy between 1309 – 1377, and its importance is reflected in magnificent architecture, most notably the Palais des Papes. There will be time to browse the boutiques or sample the café culture in the town square. This afternoon, your Tour Guide introduces Les Baux- de- Provence. Spectacularly positioned overlooking the countryside for miles around, this charming village offers ample opportunities to shop for gifts and souvenirs. Return to Napoleon for cocktails and canapes before dinner onboard. Begin the day with a tour of Arles, where Van Gogh painted in 1888-89. Scenes in this town still look exactly as he had portrayed them. Enjoy time at leisure to browse the boutiques or sip a drink in the café that Van Gogh painted! After an afternoon cruise, Saint Remy-de-Provence provides a second excursion related to Van Gogh. He lived here for several months and painted many scenes of the village, the surrounding fields, and mountains in the distance. Back on board, Chef is preparing your gala Farewell dinner, ending your cruise in style. In the afternoon, you will be met in the lobby of your Paris hotel by a transfer agent and chauffeured to the Gare de Lyon Train Station. Your cruise includes round trip First Class train tickets between Paris and your cruise route. As you alight at the Lyon TGV Station, a member of Napoleon crew will be on the platform and will chauffeur you to the barge moored in the heart of Lyon. After the traditional welcome and introduction to crew, take a sunset stroll before the first of many gourmet dinners onboard. Discover Lyon this morning, as your Tour Guide introduces the Basilica of Notre-Dame de Fourviere, a Gothic Revival church affording panoramic views of the city. Then it’s strolling and shopping along the cobblestoned streets of Vieux Lyon, a well-preserved Renaissance neighborhood lined with 16th century buildings. This afternoon, Napoleon begins cruising as she slips onto the River Saone. Lounge on the deck, read in the salon, or laze in the hot tub while sipping champagne before Chef presents tonight's gourmet dinner. Begin the day with a tasting of Beaujolais wines at Chateau de la Chaize, one of the largest private estates in the region. Return to the Napoleon for an afternoon cruise. Relax on deck and watch the scenery slip by, or socialize in the spacious salon. Upon mooring, your Tour Guide escorts you to the picturesque and historic site of Roche de Solutre, the cradle of the Pouilly-Fuissé wine appellation. Stunning views spanning the vineyards, the surrounding towns, and the magnificent river await. Back onboard, Chef serves tonight's gourmet dinner. 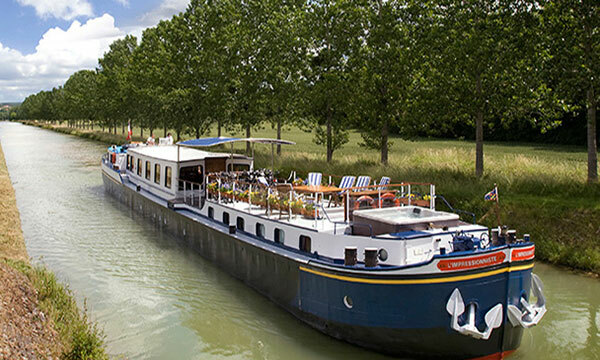 This morning, lounge on the deck with a cup of coffee or join the Captain in his wheelhouse as Napoleon glides by panoramic scenes of the Saone Valley. In the afternoon, discover the Benedictine Abbey of Cluny which was, until St. Peter’s Basilica in Rome was built, the largest church in the world. Once a wealthy Benedictine order, its powerful religious influence was felt throughout all of Europe. Explore of the remains of the church, including the peaceful cloisters. Return to the Napoleon as Chef puts the final touches on tonight's dinner. A morning walking tour of Chalon-sur-Saone reveals what was once a European trading center of importance in the Middle Ages. Meander through a traditional French market held outdoors in the city’s cathedral square; browse the arrays of colorful produce, trays of freshly baked pastries, and wheels of locally produced cheeses. This afternoon, Napoleon makes her last leg of the journey as she floats to her final mooring. Enjoy aperitifs and appetizers as Chef is crafting tonight's delicious Farewell Feast. 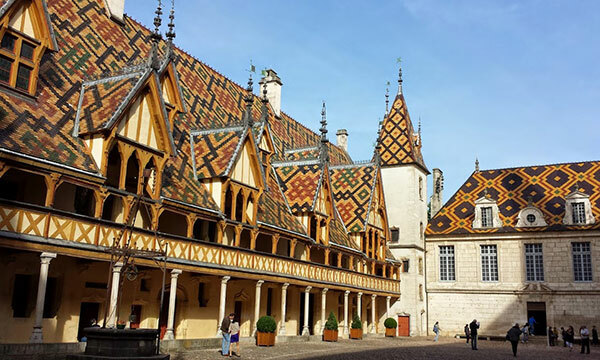 In the morning after breakfast, you will be chauffeured to the Dijon TGV Station and provided with First Class tickets to a late morning train back to the Paris Gare de Lyon Train Station. As you alight, a representative of Napoleon will be on the platform and will help you to the taxi line or to your pre-arranged private transfer. Estimated arrival time back to Paris is 11:00 am. The services of the Napoleon end at the Gare de Lyon.